I imagine the figure of Karl Lueger holding balloons that have sayings and quotes written on them that thematize racism, racial politics and Austria's national socialist history. They could include historic quotations from Lueger himself, typical sayings, but also thoughts collected from passers-by in a suggestion/thought box placed at the foot of the statue. (I imagine a simple form with a couple of prompts for people to fill out that perhaps the students at University could help me develop?). Visually the balloons remind of a political rally or party event, but they also look like thought bubbles you see in comics. 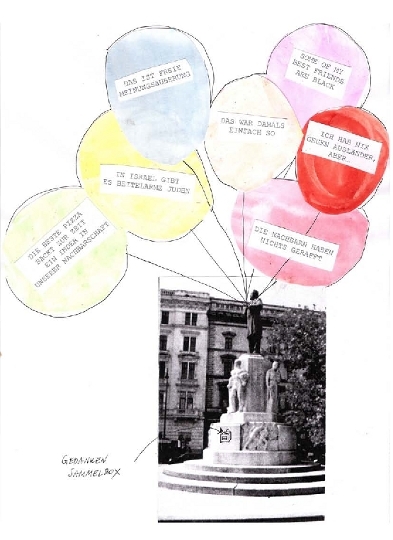 I think the balloons and colors will draw people to engage with the piece, an inviting them to share their thoughts and be included in the project may help me make some thoughts that are often kept hidden to become visible and open to discussion.